Yes, It's in Stock! Click Here for details. 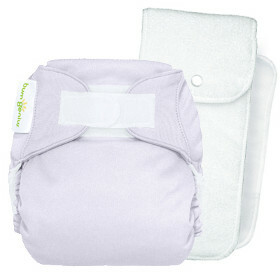 The newest version of the very popular bumGenius One Size diaper made by Cotton Babies. Same great fit. Adjustable Size Diaper can go from Small to Large using the front snaps to shorten or lengthen for great, long-lasting fit. Soft Stay-Dry Fabric against baby's skin guards against rashes by keeping wet cloth away. Non-pilling. Two Inserts Included with every diaper. Newborn insert - for a trim newborn fit or an added doubler later - and a larger One Size bumGenius! that absorbs 10 ounces. Stretch-to-Fit Tabs give your baby a snug, comfortable fit. 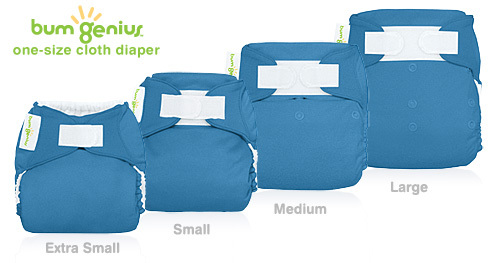 No other diaper on the market fits like a bumGenius! Note from Amy: If you are planning to use these diapers from birth through potty training, we recommend that you purchase 24-36 of them so that your diapers will be in wide rotation. Wear and tear does take a toll if you only have a handful and those diapers are used constantly for such a long period of time. click swatch to change product color Color Qty. • PUL (polyurethane outer) is durable, waterproof and colorfast - even washed on HOT. • Stretchy tabs for just the right snug fit - as easy as a disposable! • Unique covered-pocket design keeps the insert off of your baby's skin and away from clothing. Fasten tabs to laundry tabs on inside of diaper - this is important! • Stuff the pocket while the laundry tabs are closed. 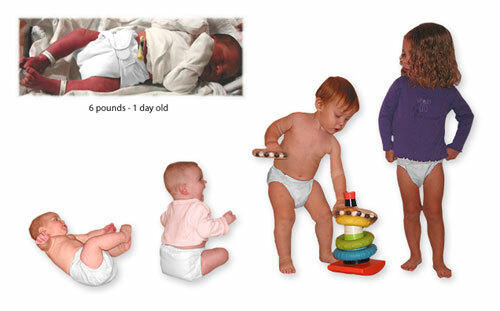 • Move your baby to the next snap setting if snaps try to pull apart as you put the diaper on. • If your little baby is a heavy wetter, you may use the larger insert snapped down. • Poo up the back? Leave the insert inside during the cold pre-soak/pre-wash part of your washing routine. • Also, you may fasten the velcro as if it is on your baby, rather than the laundry tabs, if they are soiled. • If you ever experience repelling, hand wash with Dawn liquid dish soap to remove build-up of residue. Copyright © 2006-2009 Wee Bunz, Inc. All rights reserved.